Lesson here: See injustice, challenge it! Surfer Marguerite Vujcich says she is happy to take up the challenge of encouraging more women to compete at the sport’s national champs. A competitive surfer who accused Surfing New Zealand of running a “sexist” national championship says she is happy the organisation has agreed to look at adding more female categories . Former barrister Marguerite Vujcich, 56, last month accused Surfing NZ of not meeting its obligations under the Human Rights Act because its national championships include multiple 5-year age group categories for male surfers aged 30 to 60-plus, but only one “senior women’s” category to cover all females in that age range. The organisation has now said the categories were demand-driven and it would expand the female divisions if more women put their names forward to compete. The issue was discussed at Surfing NZ’s annual general meeting held in Raglan over the weekend. A remit seeking to have the same age categories for men and women was defeated but executive officer Greg Townsend said there was no “philosophical” issue with the proposal, and the organisation’s membership would revisit the decision if more female competitors came forward. Surfing NZ president Chris Fougere said he had challenged Vujcich to encourage more women to sign up for the next nationals, to be held in Dunedin in January, and if numbers warranted it, more female categories would be run. 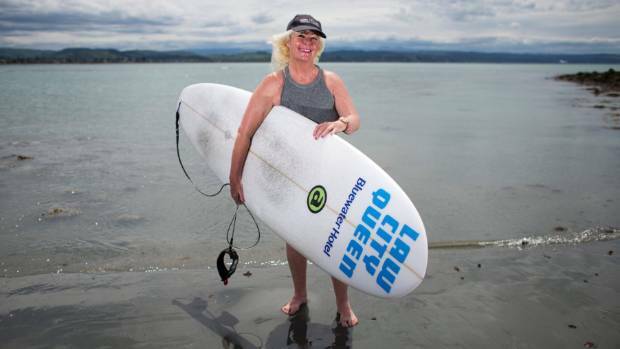 Hawke’s Bay-based Vujcich said she was happy to take up the challenge and had got a “great response” when she began phoning around South Island surf clubs to encourage female members to participate. Fougere said it was inevitable more women’s categories would be run over time because females were increasingly taking up competitive surfing.